Aquacleaner is the industry leader in waterfront restoration technology. Aquacleaner provides services for Lakes, Ponds, Oceans, Canals, Golf Courses, Irrigation Ponds, Beach Re-nourishment, Municipal applications, Water Treatment Holding Tanks, Acid Mine Drainage, Landscape Agricultural Drainage, Oil Sheen, MTBE removal (marina’s) and First Response/waste removal. No matter the size of the job, we will always operate with the highest levels of professionalism. Aquacleaner is on the leading edge of technology in the field of Suction Harvesting and Suction Dredging Equipment. Suction Harvesting offers the best short and long-term solutions to controlling and eradicating the spread invasive Aquatic Vegetation. Dredging is no longer a nasty 8-letter word, but rather is a natural step in the restoration of any body of water. Lake Bottoms get soft and fill in through many means, which only helps further their demise. 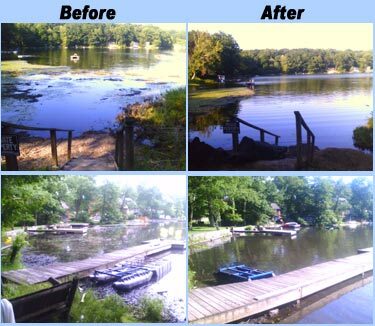 Aquacleaner equipment and the methodology behind its use offers a real source of remediation to YOUR LAKE PROBLEMS. Your pond is a part of your landscaping that accentuates your property, supports it’s own ecosystem and can be a source of great recreational entertainment. 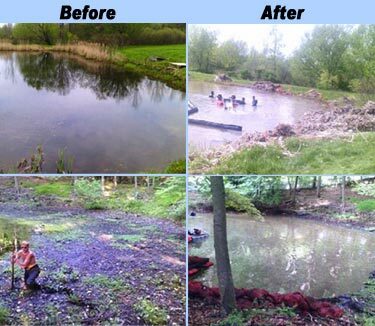 The dynamics that occur in a pond are vastly different from those of lakes and other bodies of water, and as such, require different methods to maintain and perform remediation on. Aquacleaner is on the leading edge of technology in the field of Suction Harvesting and Spot Dredging Equipment, and is the perfect solution to reclaim or maintain your pond. Suction Harvesting offers the best short and long-term solutions to controlling and eradicating the spread invasive vegetation as well as the removal of a variety of debris (leaves, sticks, timber, rock). Dredging is no longer a nasty 8-letter word, but rather is a natural step in the restoration of your pond. Our system is derived from years of experience in the field and has proven to be the most environmentally safe method. Aquacleaner has refined and developed technology for dredging as a means of restoring and reclaiming lakes and ponds by manufacturing a small dredge pump and a unique system that delivers impressive results. Typical issues involved in the permitting process focus on the disturbance in the water and up land. Our system offers the means to remove accumulated organic sediment with a minor, short term impact in the water and because we don’t move large amounts of material at any given time, we can manage what we move up land with minimal impact as well. Our system is so unique that it was featured on the discovery channels show “Dirty Jobs”. Golf Courses have a unique situation because they use their ponds and waterways for irrigation and atheistic purposes as traps for their golfers. Your Pond is simply your holding tank for water so that you can irrigate your grounds. Ponds contain the heaviest concentration of Weeds and Vegetation and that can only mean huge problems for you due to the constant stagnant and shallow water. Aquacleaner is on the leading edge of technology in the field of Suction Harvesting and Spot Dredging Equipment. Suction Harvesting offers the best short and long-term solutions to controlling and eradicating the spread invasive vegetation. Suction Dredging is the natural step in the restoration of any body of water because it removes the accumulated organic sediment with minimal impact in the water and upland. Our equipment is small and portable enough to solve a wide array of problems. The Aqua Cleaner is the Ultimate Under Water Dive Recovery System because it provides law enforcement divers with a complete system that allows them to sift through and move large amounts of soil that would be impossible to move manually. Our system provides divers with all the tools necessary to work in the unforgiving terrains they find while working underwater. No matter how skilled a dive team may be, the idea of them poking and prodding there way through a waters bottom is an undaunting, pain staking task that until now seemed to be the only way to accomplish these goals. Now with the Aqua Cleaner, a dive team can move unrestricted without air tanks, and move large amounts of soil while sifting through it to find whatever it is their looking for. Aquacleaner is on the leading edge of technology in the field of Suction Harvesting and Spot Dredging Equipment. Suction Harvesting offers the best short and long-term solutions to controlling and eradicating the spread invasive vegetation. The core of this technology also makes it a useful tool for the removal of a various types of debris obstructing the flow of water. Dredging is no longer a nasty 8-letter word, but rather is a natural step in the restoration of any body of water. Lake Bottoms get soft and fill in through many means, which only helps further their demise, and our system is the least disruptive to the ecosystem both in the water and upland. The cleaning of the bottoms of water storage tanks becomes an easy task as well. Aquacleaner is a company that manufactures several unique machines that offer real solutions in the restoration and reclamation out your lake. When groups of people have homes on a common body of water, they face similar, reoccurring problems that need to be dealt with as a group. If one house on a lake has problems with aquatic vegetation, silt, leaves, rocks, sticks or zebra mussels, it’s reasonable to assume that most others on the lake share similar problems. Starting with individual homeowners helps begin the reclamation process, which can be then extended to areas of the lake that are problematic. The dynamics that occur in water provide the best medium (better than air) for various types of problems to travel freely from one place to another and spread. The process of reversing and reclaiming what Mother Nature has left you requires a group effort with a short and long term plan.